Date of Occurrence: Monday, May 2, 2011 at 9:50 a.m.
Bear- The Delaware State Police have arrested an Elkton, Maryland man after he attempted to rob a Bear area pharmacy by calling in a fictitious gas leak yesterday morning. The incident began at approximately 9:50 a.m. yesterday morning (May 2) as a male subject called the Rite Aid Pharmacy located in the 700 block of Governor’s Place, Bear, claiming to be an employee of Delmarva Power. The subject advised the pharmacy employee who answered the phone that there was a gas leak in the shopping center and that the Rite Aid needed to be evacuated. The subject then hung up the phone. Approximately ten minutes later, the subject called the store again and repeated the same story he had told previously. However, the employee was suspicious of the caller and contacted the police who responded to the store. At approximately 11:00 a.m. the suspect called the store a third time, however; the phone was answered by a state trooper who was investigating the incident. The trooper identified herself as an employee of the Rite Aid and told the subject that she wanted to discuss the gas leak with him. 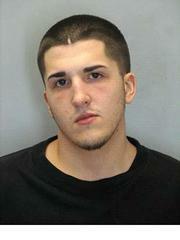 The subject then advised the trooper that he was in the rear of the store in a Delmarva Power work truck. The trooper responded to the rear of the store where she observed a suspicious male subject dressed in all black clothing and gloves. The subject, later identified as Daniel Rosado, 21, was detained by the trooper who realized that his voice was similar to the subject she had spoken to on the phone. The trooper then conducted a pat down search of Rosado. During the search a fully loaded 40 caliber handgun, gloves, face masks, and plastic zip ties were all located in Rosado’s possession. After further investigation, Rosado was arrested and charged with the above list of crimes. He was arraigned at JP Court 2 and then committed to the Howard Young Correctional Institution after failing to post $55,000 secured bail.